Background and Objectives: Pirfenidone is an orally available antifibrotic agent that has shown benefit in animal models of pulmonary and renal fibrosis and in clinical trials of pulmonary fibrosis, multiple sclerosis, and hepatic cirrhosis. Our objective was to determine whether pirfenidone slows the loss of renal function in focal segmental glomerulosclerosis. Design, Setting, Participants, & Measurements: An open-label trial was performed to evaluate the safety and efficacy of pirfenidone in patients with idiopathic and postadaptive focal segmental glomerulosclerosis. The monthly change in estimated GFR, expressed as ml/min per 1.73 m2, was compared between the baseline period and the treatment period. During both periods, patients received angiotensin antagonist therapy if tolerated. Twenty-one patients were enrolled, and 18 patients completed a median of 13 mo of pirfenidone treatment. Results: The monthly change in GFR improved from a median of −0.61 ml/min per 1.73 m2 (interquartile range −1.31 to −0.41) during the baseline period to −0.45 ml/min per 1.73 m2 (interquartile range −0.78 to −0.16) with pirfenidone therapy. This change represents a median of 25% improvement in the rate of decline (P < 0.01). Pirfenidone had no effect on BP or proteinuria. Adverse events attributed to therapy included dyspepsia, sedation, and photosensitive dermatitis. Conclusions: It is concluded that pirfenidone is an attractive candidate for placebo-controlled trials in patients with progressive chronic kidney disease. FSGS is the predominant cause of primary nephrotic syndrome in many countries, including the United States, and is the leading cause of ESRD among children (1). FSGS, defined by the characteristic pathologic findings, is a complex syndrome associated with multiple causes and variable clinical severity (2). FSGS includes an idiopathic form (most common), reactive forms (postadaptive and medication associated), and genetic forms. Postadaptive FSGS includes cases associated with glomerulomegaly and glomerular hyperfiltration, occurring in the setting of reduced nephron mass (e.g., congenital oligomeganephronia, remnant nephron, reflux nephropathy) or normal nephron mass (e.g., sickle cell anemia, obesity). Collapsing glomerulopathy represents another disease in the spectrum of podocytopathies, characterized by podocyte proliferation and glomerular capillary tuft collapse. Collapsing glomerulopathy also can be classified by idiopathic, reactive (including HIV associated), and genetic forms. Given the heterogeneity in the cause of FSGS, responses to the existing therapies have also been variable, with only a fraction of patients responding to remitive therapies such as glucocorticoids and cyclosporine (3,4). FSGS in adult patients remains refractory, or frequent relapses and progression to ESRD are experienced. The rate of GFR loss varies from patient to patient, even among patients with the same renal disease, but for a given patient, the rate is generally believed to be constant (5). Recently, however, it was suggested that the decline slope may accelerate late in the course of chronic kidney disease (CKD) (6). Despite improved therapies in recent years with angiotensin antagonist therapy and aggressive BP control, many patients continue to lose renal function and ultimately reach ESRD. Therefore, there is a pressing need for additional therapies to stabilize renal function. Pirfenidone is an orally available small molecule that has a therapeutic potential for fibrotic diseases. The mechanism of action is not well understood, but pirfenidone has been shown to reduce TGF-β1 production, antagonize TNF-α signaling (7), and scavenge reactive oxygen species (8). Pirfenidone reduces fibrosis and prevents loss of glomerular filtration in animal models of renal disease (9–14). In the five-sixths nephrectomy rat model of postadaptive FSGS, pirfenidone treatment for 12 wk attenuates the accumulation of glomerular matrix protein, the expression of glomerular TGF-β, and the loss of glomerular filtration (14,15). Clinical trials that have evaluated safety and efficacy of pirfenidone in various fibrotic diseases have also been encouraging. In a pilot study of 15 patients with hepatitis C–associated cirrhosis, pirfenidone therapy was associated with a significant improvement of liver histology in >50% of patients (16). A double-blind, randomized, controlled study of pirfenidone for treatment of secondary multiple sclerosis revealed a marked improvement in bladder dysfunction and a significantly decreased relapse rate (17). Likewise, clinical trials of pirfenidone in pulmonary fibrosis have suggested benefit (18,19). Pirfenidone therapy has been generally well tolerated, and the associated adverse events include dyspepsia, sedation, and photosensitivity dermatitis. In light of the preliminary data to suggest that pirfenidone may ameliorate fibrosis, we evaluated safety and efficacy of pirfenidone to slow GFR decline rate in patients with FSGS. The inclusion criteria were the following: (1) Ability to give informed consent; (2) biopsy-proven FSGS in patients ≥18 yr of age; (3) monthly GFR decline rate of >0.35 ml/min per 1.73 m2 during a baseline period that lasted at least 6 mo; (4) no glucocorticoids, cyclophosphamide, mycophenolate, or other immunosuppressive drugs for at least 2 mo before starting pirfenidone therapy; (5) no cyclosporine for at least 6 mo before receiving pirfenidone; and (6) therapy with an angiotensin-converting enzyme inhibitor (ACEI) or angiotensin receptor blocker (ARB) during the baseline period, unless intolerant of both classes of medication. The baseline period was defined as an observational period before pirfenidone therapy and required adequate BP control (<130/80 mmHg Hg on >75% of measurements) and angiotensin antagonist therapy, if tolerated. The exclusion criteria were the following: (1) Known intolerance to pirfenidone; (2) an additional primary or secondary glomerular disease; (3) history of myocardial infarction within 6 mo of study entry; (4) history of peptic ulcer within 6 mo; (5) history of cerebrovascular disease within 6 mo; (6) pregnancy, breast feeding, or inadequate birth control; (7) history of photosensitivity dermatitis; (8) renal transplantation; and (9) evidence of significant hepatic disease, as indicated by serum transaminases more than three times the upper limit of normal, prothrombin time >2 s prolonged. We enrolled 21 adult patients with biopsy-proven idiopathic and postadaptive FSGS and idiopathic collapsing glomerulopathy between 2000 and 2004 at the Clinical Center of National Institutes of Health (NIH). This was an open-label, single-center pilot study intended to gather preliminary evidence of the efficacy of pirfenidone to slow the rate of GFR decline in patients with FSGS. Study duration was 12 mo, with an option of two 24-mo extensions for eligible patients: Patients who experienced at least a 25% improvement of the GFR decline rate during the pirfenidone period compared with the baseline period were given an option for a 24-mo extension. Patients who maintained a ≥25% improvement over the baseline GFR decline rate during the first extension period were then given an option for a second 24-mo extension. The protocol was approved by an institutional review board, and all patients gave informed consent. The medical records of patients who were referred to NIH were reviewed, including renal biopsy reports, treatment history, comorbidities, and BP measurements and laboratory data during the preceding ≥6 mo. On the basis of at least four measurements of serum creatinine during this period, change in estimated GFR (ΔGFR) was calculated and is referred to as the GFR decline rate. The patients who met the inclusion criteria were then invited to the NIH to undergo further baseline testing with complete blood count and differential, chemistry profile, hepatic panel, lipid profile, thyroid function tests, creatine phosphokinase, amylase, hepatitis B and C and HIV serologies, syphilis serology, and three 24-h urine collections for protein and creatinine. The potential participants whose BP was poorly controlled or who were not yet on ACEI or ARB were followed prospectively on therapy for at least 6 mo. Formal pirfenidone pharmacokinetics revealed that baseline GFR does not significantly affect the metabolism or clearance of the parent compound (S.R.P., manuscript in preparation). Therefore, the target dosage was 800 mg three times daily. Pirfenidone therapy was initiated at 400 mg three times daily and escalated to full dosage after 2 wk when symptoms permitted. All patients were instructed to take pirfenidone with meals to minimize gastrointestinal symptoms. Six patients experienced persistent dyspepsia or fatigue, which were tolerable at a less than maximal dosage; this dosage was determined within a few weeks (Table 1). During each of seven visits during the 12-mo period, patients were examined; adverse event history was taken; and laboratory testing was performed including complete blood count, chemistry profile, liver function tests, lipid profile, and random urine protein-to-creatinine ratio. Pirfenidone trough levels were measured using thin-layer liquid chromatography, when patients had been on a stable three-times-daily dosing for at least 2 mo; the sample was drawn at 8 a.m., typically 12 to 14 h after the last pirfenidone dose. GFR was estimated using the five-variable Modification of Diet in Renal Disease (MDRD) equation, which includes terms for race, age, gender, serum urea nitrogen, and serum creatinine (20). The outcomes of the study included safety and tolerability of pirfenidone in a new patient population. The primary efficacy outcome of the study was the monthly rate of ΔGFR during the treatment period (expressed as ml/min per 1.73 m2) compared with the monthly rate of ΔGFR during the baseline period at 12 mo. For patients who exited the study before completing 12 mo of therapy, the slope observed while taking pirfenidone was used as the 12-mo slope. Secondary outcomes included the rate of ΔGFR during the extension periods compared with the baseline period and the change in urine protein excretion at 12 mo. Because the values of GFR in both baseline and treatment periods did not follow a parametric distribution, the Wilcoxon matched-pair signed rank test was used to analyze the primary outcome. Analysis of BP and proteinuria during baseline and pirfenidone periods were compared using paired t test. Data are presented as mean ± SD or median with interquartile range (IQR) for parametric and nonparametric data, respectively. Correlations between continuous variables were analysis by Spearman correlation. Effect size was defined as follows: Absolute value (GFR change slope during pirfenidone treatment)/absolute value (GFR change slope during baseline period). All GFR change rates were negative in both baseline and pirfenidone periods. Under these conditions, values for the effect size ranged from 0 (stabilization of GFR change) to >1 (acceleration of GFR decline). Statistical analysis was performed using Prism software (GraphPad, San Diego, CA). A two-tailed P < 0.05 was considered statistically significant. Of the 21 patients who enrolled in study, three stopped therapy within 4 wk of initiating therapy; the reasons were newly diagnosed colon cancer, disabling sedation, and noncompliance. Because the study was designed to evaluate the efficacy of pirfenidone (results under optimal circumstances) rather than the effectiveness of pirfenidone (results under real-world conditions, often involving intention-to-treat analysis), data from these three patients were not included in the efficacy analysis. The remaining 18 patients included 11 men and seven women; eight were African American, eight were European American, and two were Asian American. Age at study entry was 47 ± 10 yr. The mean baseline estimated GFR was 26 ± 9.4 ml/min per 1.73 m2, with the median baseline proteinuria of 2.8 g/d (IQR 1.7 to 4.2). The median duration of angiotensin antagonist therapy was 15 mo (IQR 8.4 to 33) before starting pirfenidone therapy. Two patients did not receive angiotensin antagonist therapy during the baseline periods because of angioedema (patient 11) and hypotension (patient 12). Patient 11, however, was started on losartan by his local physician at month 8 and remained on the therapy for the remaining trial. One patient (patient 8) stopped an ACEI as a result of hyperkalemia 1 mo before starting pirfenidone, after having been on therapy for 31 mo. Patient 15 stopped an ACEI after having being on pirfenidone therapy for 6 mo as a result of hyperkalemia. In the remaining patients, the dosages of ACEI or ARB remained constant throughout both the baseline and treatment periods. Nine patients had received immunosuppressive therapies before enrollment (four patients received cyclosporine), and three of these patients had received more than two different immunosuppressive medications. The median duration of time since stopping the last immunosuppressive therapy and starting pirfenidone was 13 mo (IQR 5.6 to 31). Fifteen patients had idiopathic FSGS, one patient had postadaptive FSGS associated with sickle cell anemia (patient 2), and two patients had idiopathic collapsing glomerulopathy (patients 7 and 15). Among the patients with idiopathic FSGS, four had body mass index >35 kg/m2, but none of these renal biopsies showed glomerulomegaly, which is probably the most reliable feature in diagnosing obesity-related FSGS (21). The 18 patients completed a median of 13.4 mo (IQR 6.9 to 35.4) of pirfenidone therapy. Seven of the 18 patients discontinued pirfenidone before completing 12 mo of therapy, for reasons given in Table 1. No patients remain on therapy. The most common reason for the discontinuation of pirfenidone was development of ESRD (eight patients; Table 1). The median pirfenidone trough level was 0.69 μg/ml (IQR 0.10 to 1.74). Throughout the baseline period and during pirfenidone therapy, GFR declined in all patients (Figure 1). During the baseline period (median duration 12.1 mo; IQR 7.4 to 10.1), monthly median ΔGFR was −0.61 ml/min per 1.73 m2 (IQR −1.31 to −0.41). This GFR decline rate was based on a mean of eight creatinine values during the baseline period. During the subsequent 12 mo of pirfenidone therapy, the monthly GFR decline rate improved to a median of −0.45 ml/min per 1.73 m2 (IQR −0.78 to −0.16; P < 0.01 by Wilcoxon matched-pair test; Figure 2), based on a mean of seven creatinine values. The effect size of GFR change, expressed as the ratio between the GFR decline rate during the pirfenidone period and the baseline period, corresponds to a median of 25% improvement in monthly ΔGFR. 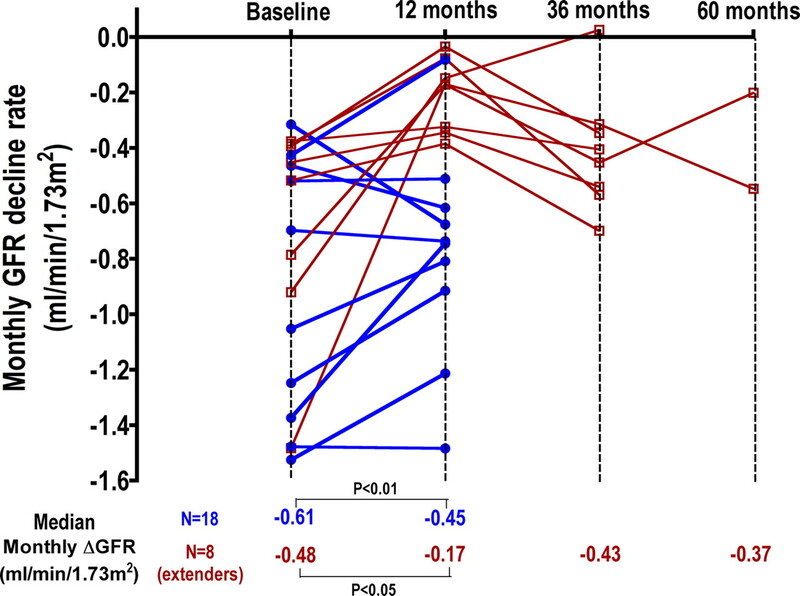 The direction of change in ΔGFR was positive in 13 of 18 patients, indicating improvement, and negative in three of 18 patients, indicating deterioration. ΔGFR did not change in two patients. There was no statistical difference between ΔGFR in the first 6 mo and the second 6 mo (P = 0.32). GFR before, during, and at the conclusion of pirfenidone therapy. Serial five-variable Modification of Diet in Renal Disease (MDRD) GFR estimates for 18 patients are shown. □, eight patients who extended pirfenidone beyond 12 mo; •, 10 patients who did not undergo an extension of pirfenidone therapy. Monthly change in GFR (ΔGFR) during the baseline and the 12-mo pirfenidone periods, expressed as median and interquartile range (IQR). During the baseline period, monthly median ΔGFR was −0.61 ml/min per 1.73 m2 (IQR −1.31 to −0.41). 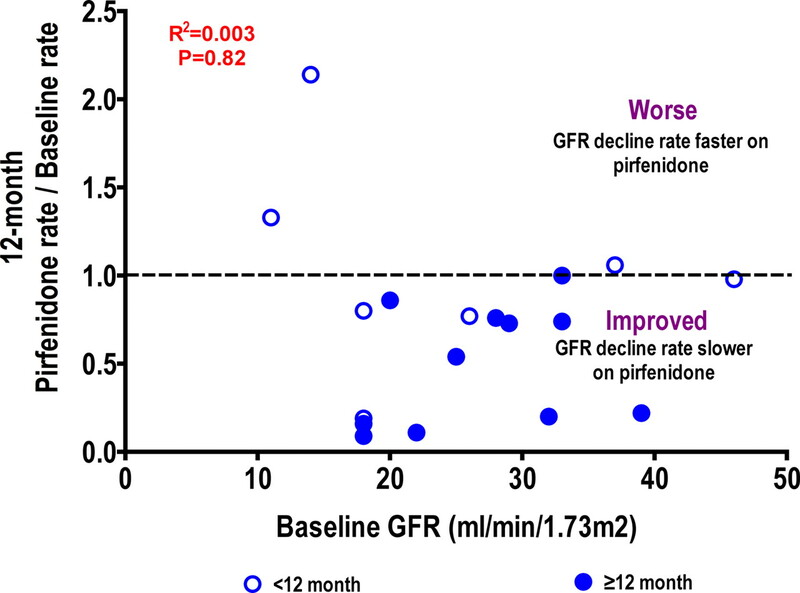 During the subsequent 12 mo of pirfenidone therapy, the monthly GFR decline rate improved to a median of −0.45 ml/min per 1.73 m2 (interquartile range −0.78 to −0.16; P < 0.01 by Wilcoxon matched-pair signed rank test). Nine patients fulfilled the criteria for the extension therapy and chose to continue pirfenidone for an additional 24 mo; however, one patient stopped pirfenidone within 2 mo of the extension as a result of ESRD (patient 15) and therefore was not included in the analysis of the extension group. Four additional patients could not complete the first 24-mo extension period because of the development of ESRD. 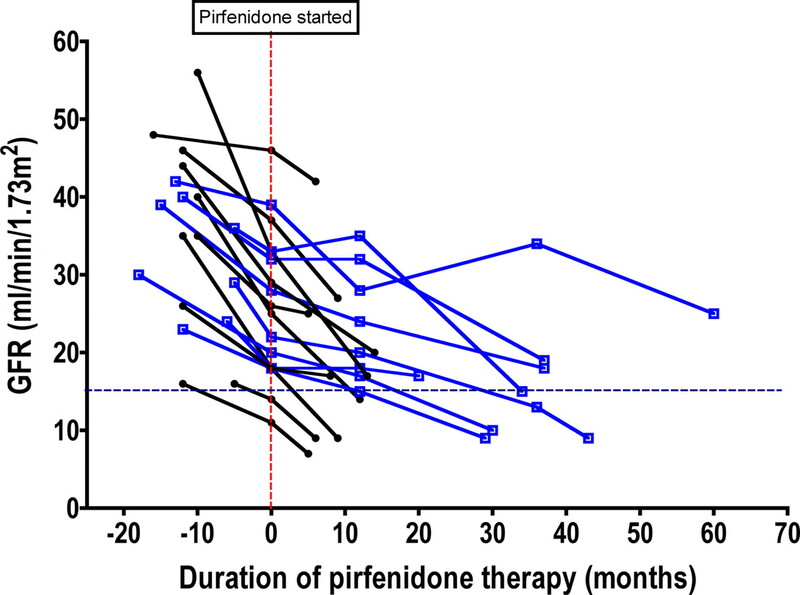 Of the remaining four patients, two were eligible for a second extension of pirfenidone therapy at month 36 (Figure 3). The median baseline GFR at the conclusion of first 12-mo pirfenidone therapy in the eight patients was 23 ml/min per 1.73 m2 (IQR 18 to 32). Their baseline monthly GFR decline rate was −0.48 ml/min per 1.73 m2 (IQR −0.85 to −0.39) and improved to a median of −0.17 ml/min per 1.73 m2 (IQR −0.33 to −0.11) during the first 12 mo. During the first extension period (12 to 36 mo), however, the improved GFR decline rate was not sustained and the ΔGFR increased toward the baseline rate, with a median of −0.43 ml/min per 1.73 m2 (IQR −0.55 to −0.33). The overall P value comparing the GFR decline rates for the eight extenders at the conclusion of each study period was statistically significant (P < 0.01, Kruskal-Wallis test; Figure 3); however, the only pair-wise comparison among these periods that was significant was the baseline period compared with the 12-mo period (P < 0.05). Monthly GFR decline rate during the baseline period, the 12-mo pirfenidone period, and the two extension periods. Ten patients discontinued pirfenidone by or at 12 mo (•). Eight patients (□) continued pirfenidone for an additional 24 mo, and at 36 mo, two patients were eligible for the second extension of pirfenidone therapy. One patient whose GFR decline rate was further improved during the first extension period could not continue with pirfenidone because of the development of ESRD. 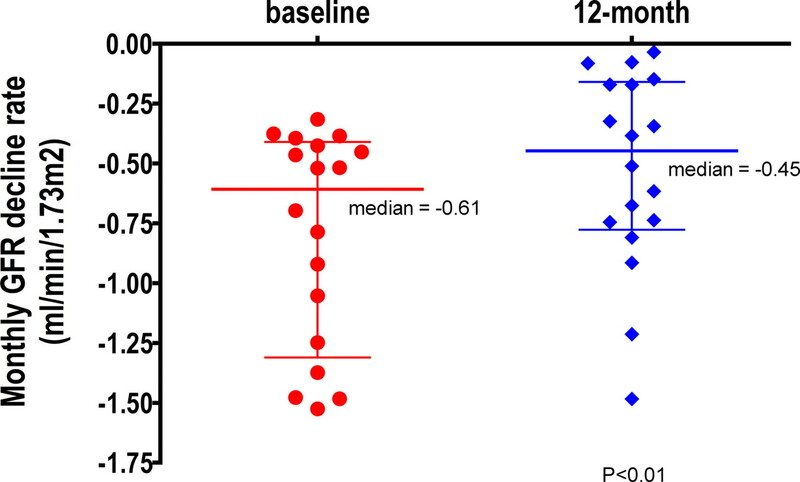 The median GFR slopes for all 18 patients were tested with Wilcoxon paired-match signed rank test (P < 0.01), as shown in Figure 2. For the eight patients who received pirfenidone beyond 12 mo, the four values for the median GFR slopes over the periods shown were significantly different (P < 0.01 by the Kruskal-Wallis test); however, the only pair-wise comparison among these periods that was significant was the baseline period compared with the 12-mo period (P < 0.05). In another approach to determine whether pirfenidone therapy was associated with prolonged renal survival, we calculated the predicted time to reach an end point, defined either as GFR 15 ml/min per 1.73 m2 or the last known GFR in those who had not reached ESRD at study end. The predicted time to reach an end point (without pirfenidone) was calculated by using an equation that included the baseline GFR and the baseline GFR monthly decline rate. The predicted median time to reach the defined end point was 11 mo (IQR 6 to 23), compared with the observed median of 17 mo (IQR 7 to 37). Thus, pirfenidone prolonged renal survival by approximately 55%, although this was not statistically significant (P = 0.19). Pirfenidone had no effect on proteinuria at 12 mo. Daily median protein excretion was similar between the baseline period (3.2 g/d; IQR 1.6 to 4.4) and the treatment period (4.3 g/d; IQR 1.2 to 6.7; P = 0.16). Because we observed some heterogeneity in ΔGFR response to pirfenidone, we examined variables that might explain this variability. The effect size, expressed as the ratio between ΔGFR during pirfenidone and baseline periods, was similar among black patients and those of other race (P = 0.97). Furthermore, BP measurements during the baseline period (129/78 ± 12/7 mmHg) and pirfenidone period (129/78 ± 13/9 mmHg) were not statistically different. There was also no difference in the 12-mo ΔGFR in statin users versus non–statin users (P = 0.54). The baseline proteinuria also did not correlate with the 12-mo GFR decline rate during the pirfenidone period (P = 0.74). In addition, there was no correlation between entry GFR and change in ΔGFR (R2 = 0.003, P = 0.82; Figure 4). Nevertheless, it may be relevant that two patients with entry GFR <15 ml/min per 1.73 m2 experienced the largest acceleration in GFR decline rates and progressed to ESRD within 6 mo. Thus, pirfenidone may be ineffective in those with severe CKD. There was also no correlation between baseline ΔGFR rate and the effect size (R2 = 0.01, P = 0.67). This may simply reflect the statistical tendency toward regression to the mean or alternatively may reflect the faster GFR decline once patients reach severe renal dysfunction. It is interesting that there was a trend toward improved effect size with higher pirfenidone trough levels, although the correlation was not statistically significant (R2 = 0.1, P = 0.2). Effect size of pirfenidone therapy and baseline GFR. The effect size is expressed as the ratio between the GFR decline rate during the 12-mo pirfenidone period versus during the baseline period. There was no significant correlation between the baseline GFR and the effect size. ○, Patients who stopped pirfenidone before 12 mo. The occurrence of adverse events that are known to be associated with pirfenidone are summarized in Table 2 for all 21 enrolled patients. Eight (38%) patients experienced dyspepsia or abdominal discomfort, three of whom required dosage reduction. Four patients required ranitidine or a proton pump inhibitor to treat dyspepsia. Sedation occurred in six (29%) patients; most cases were mild and did not interfere with activities of daily living. One patient, however, could not tolerate pirfenidone because of severe sedation and exited the trial within 4 wk. Two (10%) patients developed photosensitivity dermatitis that prompted discontinuation of pirfenidone therapy, after which the dermatitis resolved. All patients were counseled to use sunscreen and to avoid exposure to direct sunlight. Serious adverse events included one death (traumatic subdural hematoma judged unrelated to pirfenidone therapy), a diagnosis of colon cancer within 4 wk of pirfenidone therapy (judged unrelated to the trial) in another patient, presumed diverticular bleed (numerous diverticular lesions seen on colonoscopy without active bleeding) that required blood transfusion in one patient (judged unrelated to the trial), and elevated liver enzymes that prompted liver biopsy and exit from the study in one patient at 5 mo (judged possibly related to the trial). The liver biopsy in this patient revealed acute hepatocellular injury consistent with drug/toxin-induced injury. The cause of liver injury remained unclear, however, because the patient had also been started on allopurinol and colchicine for his severe gout during the trial. To our best knowledge, there are no published reports of hepatocellular injury in patients who are treated with pirfenidone. The principal finding of this study is that pirfenidone, an antifibrotic agent with a potent anti–TGF-β activity, may have a beneficial effect on slowing the loss of GFR in patients with advanced FSGS. As a key regulator of extracellular matrix, TGF-β has been implicated as an important mediator of renal fibrosis (22,23), particularly in FSGS (24). Pirfenidone not only suppresses TGF-β gene expression at the transcriptional level but also inhibits protein expression of TGF-β by 80% (25,26). Furthermore, pirfenidone attenuates increases in other profibrotic gene expression, such as those of collagen III and tissue inhibitor of metalloproteinase-1, in addition to preserving serum creatinine levels in salt-depleted rats that are treated with cyclosporine (27). Thus, the amelioration of a profibrogenic environment by pirfenidone likely underlies the clinical benefit that was observed in our study. Other interventions that slow progression of renal insufficiency, including control of BP and angiotensin antagonist therapy, reduce glomerular proteinuria (28,29). In this study, proteinuria was unaffected by pirfenidone. A study that specifically inhibited TGF-β by mAb treatment of diabetic mice also showed that proteinuria was unchanged, although other functional parameters of diabetic nephropathy were significantly improved (30). Pirfenidone treatment in an anti–glomerular basement membrane glomerulonephritis model, however, not only was associated with the histologic and ultrastructural improvements but also significantly decreased proteinuria (31). It is unclear whether the differential effects of pirfenidone on proteinuria that were seen in these studies reflect random variability or the inherent differences of effects of pirfenidone in various diseases. Pirfenidone and TGF-β antibody may exert a favorable effect on the progression of renal damage without improving the glomerular permeability defect that is characteristic of FSGS. Thus, pirfenidone might exert its beneficial effects primarily by reducing fibrosis in the renal interstitium. Alternatively, pirfenidone might act to limit glomerulosclerosis, but our patients might have had such severe glomerular disease that antifibrotic therapy, particularly administered for a relatively short time, was unable to ameliorate the glomerular permeability defect. In the eight patients who continued pirfenidone therapy for an additional 24 to 48 mo, the significant improvement of GFR decline rate seen in the first 12 mo was not maintained during the extension periods. This apparent loss of efficacy is of concern for the possible future clinical development of pirfenidone, but several points should be borne in mind. First, the number of patients (eight) who continued therapy is too small to draw any conclusions. Second, the GFR at the time of starting the first extension period ranged from 15 to 33 ml/min per 1.73 m2, with a median of 23 ml/min per 1.73 m2. These patients had increasingly severe CKD, and this may account for the relative loss of drug effect, although during the first 12-mo period there was not a significant correlation between GFR and pirfenidone effect size (Figure 4). Third, the tendency of GFR decline to accelerate slightly at low absolute GFR levels, as noted, may have obscured a beneficial effect of pirfenidone during the extension periods. The issue of whether pirfenidone therapy administered for a period of years can slow progression of GFR decline can be settled only with a randomized, controlled trial of sufficient power. Our study has important limitations. Foremost, this was a pilot study and lacked a placebo control. It is possible that unidentified interventions or natural variability in GFR decline rate during the treatment period contributed to the improved outcome. Because of the lack of a control group, it is also possible that the improved GFR decline rate that was observed during the pirfenidone period may simply reflect regression toward the mean. Regression to the mean is most problematic when only two measurements are taken for each patient (32). Because our study design involved multiple measurements during the baseline and treatment periods, regression to the mean is unlikely to explain our results. The second problem is that not all patients were monitored at the NIH before their enrollment, and most underwent laboratory tests in various locations. Although this interlaboratory variability may have decreased the precision of the baseline GFR decline slope, we doubt that it created a significant bias; the 18 enrolled patients all used different home-based laboratory centers, and this random configuration is unlikely to have led to a consistent bias in the creatinine measurement as compared with the NIH measurement. Third, it is formally possible that pirfenidone alters creatinine generation or tubular creatinine secretion, either of which would lead to erroneous GFR estimates while on therapy. We did not measure GFR directly and therefore cannot exclude this possibility. Nevertheless, there are no data indicating that pirfenidone has these effects. Fourth, recent data suggest that GFR decline rate may accelerate with GFR <20 ml/min per 1.73 m2. If this occurred in our patients, then it would accelerate the GFR decline rate while on pirfenidone therapy and would tend to bias toward the null hypothesis. Fifth, most of our patients had moderate to severe CKD at baseline; therefore, the study findings may not be applicable to all patients with FSGS. Sixth, we did not perform serial renal biopsies to assess whether there was histologic evidence of regression of fibrosis. Seventh, we tested only one dosage of pirfenidone. Our experience suggests that some toxicities, such as fatigue and dyspepsia, are dosage related; therefore, it may be desirable to identify the minimum effective dosage. Our findings suggest that pirfenidone may be an effective agent to slow progressive loss of renal function associated with FSGS, with a median improvement of 25% in the GFR decline rate in patients who have moderate to severe CKD and are already being treated with angiotensin antagonists. This is a comparable effect size compared with the previous larger controlled trials that showed that irbesartan or losartan treatment is associated with 18% improvement in the mean decline rate of creatinine clearance in patients with type 2 diabetes (33,34). In the Collaborative Study by Lewis et al. (35), captopril treatment in patients with type 1 diabetes and baseline creatinine ≥1.5 mg/dl was associated with a 38% improvement in creatinine clearance decline. Given the much more severe baseline renal dysfunction in our patients compared with those in these diabetic trials, it is encouraging that our study suggests that pirfenidone may still have antifibrotic effects in advanced stages of CKD. A randomized, placebo-controlled, dosage-ranging, phase II trial to evaluate safety and efficacy of pirfenidone to preserve GFR in patients with diabetic nephropathy recently completed recruitment. The treatment phase for this diabetic study will end in August 2007. The results from this trial may provide an important insight to understanding and further defining the role of pirfenidone in fibrotic renal diseases, for which there is very limited available therapy. This clinical trial was supported by the Intramural Research Program of the National Institute of Diabetes and Digestive and Kidney Diseases, NIH. Pirfenidone capsules were supplied to the NIH Clinical Center by Marnac and InterMune via Material Transfer Agreements. This study first appeared as an abstract (J Am Soc Nephrol 15: 326A, 2004). We thank Dr. Solomon Margolin of Marnac and InterMune for providing pirfenidone and helpful advice about drug dosing, Judy Starling of the NIH Clinical Center Pharmacy for overseeing dispensing of pirfenidone, Michelle Braun and Denise Knisely-Carrigan for expert nursing assistance, and Dr. Robert Star and Dr. James Balow for critical reviews of the manuscript. We also thank Dr. Warren Goux (University of Texas, Dallas, TX) for measuring the pirfenidone levels. See the related editorial, “Do We Have a Pill for Renal Fibrosis?” on pages 876–878. Do We Have a Pill for Renal Fibrosis?